Charming one bedroom flat in historical center of Collioure .Wifi acces. In the hearth of Collioure, in the most flowery pedestrian street, 5 minutes from the beach, shops and restaurants. 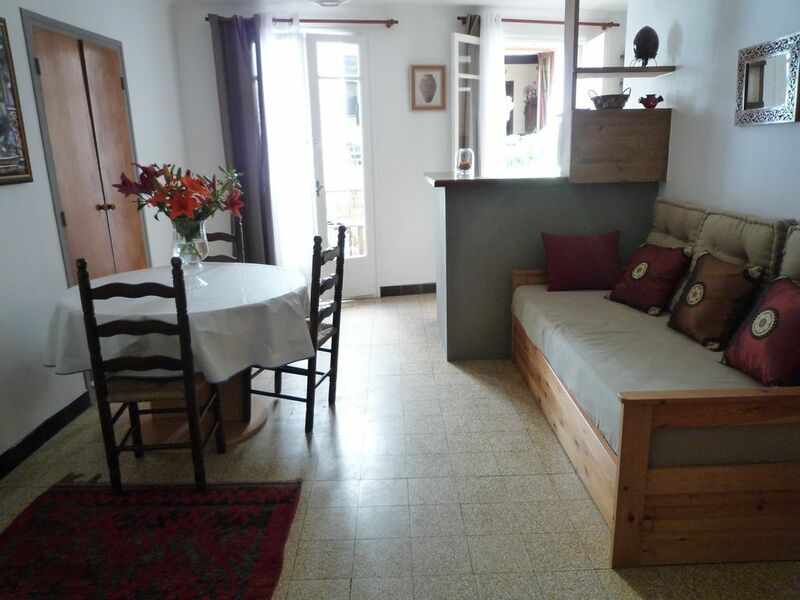 This beautiful apartment, recently renew and all equipped. You will find all you need to have the most pleasant stay. In the morning you will enjoy your breakfast on the balcony and appreciate the quietness of this garden street. Washing machine, electric cooker, fridgefreezer, micro waves, toaster, kettle. We spent a very pleasant week in M Roch's apartment above his son's artists shop. Aleksandre their agent was there to welcome us on arrival having arranged a tax for us from the air port, which was cheaper than on line. Everything one needs is in the apartment which is quite compact and charmingly french but plenty of room for 2 . The best part is the balcony where you can have a coffee and watched people strolling along the street, including the travelling musicians. Jean Phillippe who runs the artist's shop downstairs was very charming and helpful and always smiling. Collioure itself is delightful and we spent many hours strolling around the streets and sitting on the front overlooking the bay with a glass of wine. There are many restaurants to choose from and the food is excellent. We are already planning our next visit to Collioure and the same apartment. Thank you very much for your comment following, your recent stay in our appartement in Collioure. We are very happy that you spend nice time with us . Great location, most friendly ownership team, but very modest accommodations. We are torn. On the one hand, Jean Phillip (the owners' artist son with his gallery downstairs) and Alexhandra (the owners' agent), were extremely friendly, helpful and trustworthy. On the other hand, we feel obliged to be candid about what one is getting in this flat. The positives include its central location and easy walk to all places of interest in this delightful seaside village, and its reasonable price. The kitchen is equipped and adequate, with an apartment size refrigerator and two burner stove (and the usual dishes, pots, pans, cutlery and condiments, etc). There are nearby ancient forts, a castle, lots of restaurants and local shopping, and many paths and walkways to explore. Everything is clean and safe. And, there is much to see and learn about in this Catalan region of France (and Spain). Moreover, both Jean Phillip and Alexhandra are most helpful in their recommendations and flexibility. However, the apartment itself is very small, and feels rather "dark" inside. To be sure, the living area and one-person balcony front on a very narrow, charming, medieval, cobblestone-style street with floor to ceiling double glass doors that allow as much natural light as possible into the unit (because of the adjacent buildings and the narrowness of the lane, there is no direct sun). But, this is not a place in which you are going to want to hang out. Also, the bathroom is tiny, with an odor that Jean Phillip attributed to a change in the weather. There also is a charge for any sheets and towels (20 euros), and a mandatory cleaning charge (30 euros). Finally, and understandably given the historical location, there is no parking. A municipal facility (14 euros per day) is about three blocks away; or one can compete for a space on a wider street on the outskirts of the village about two+ blocks up the hill. The bottom line is that this is an adequate flat at a good price. We were expecting a little more. Thank you very much for your comment following your recent stay in Collioure . The apartment is perfectly located to enjoy the atmosphere of the artist community in Collioure, close to everything for tourists but also situated in a lively street with its own character. The neighbours are friendly and the customer service was excellent. A fabulous art gallery on the ground floor provided a great souvenir of the trip. This apartment was perfect for what we needed. It is not luxury, but it had everything we needed and was impeccably clean. The location is it's strongest plus. It is on a gorgeous pedestrian street that is within walking distance to almost EVERYTHING. In fact, we parked our car and did not use it until 3 days later when it was time to leave. Mr Roch, in the storefront downstairs was happy to help us with local tips of places to shop and things to do. Such a nice man; it was a pleasure to meet him. Thank you for such a wonderful stay in one of the most beautiful towns I've ever visited. Tout aurait été parfait (accueil chaleureux d'Aleksandra, studio bien équipé, très fonctionnel, situé dans une rue pittoresque ) s'il n'y avait un resto juste en dessous. Trop de bruit en soirée. C'est le seul bémol ! Studio sympathique dans une rue très, très animée, mais de ce fait un peu bruyant. Un double vitrage serait nécessaire. L' avantage de sa situation fait que nous pouvions déambuler en ville comme nous le souhaitions. Les galeries d'art nous ont beaucoup plu et nous avions la chance d'avoir un artiste original et très sympathique comme voisin. A mentionner aussi de très bons restaurants dans la même rue. Séjour très agréable qui nous a laissé de bons souvenirs et l'envie de revenir à Collioure. Collioure is called the jewelry of the Mediterrean coast. The most famous painter like Matisse,Picasso...came to find inspiration under the blue sky rising from the tuquoise sea.